With Leopard, Apple introduced the translucent menu bar effect. Many people did not like this because it is difficult to see on some backgrounds. With the release of 10.5.2, this is easily turned on or turned off based on your preferences. Out of all the changes leopard introduced, the translucent menu bar was one of features that users complained about the most. After many hacks and work arounds, the latest leopard update makes disabling this effect easy. 3. 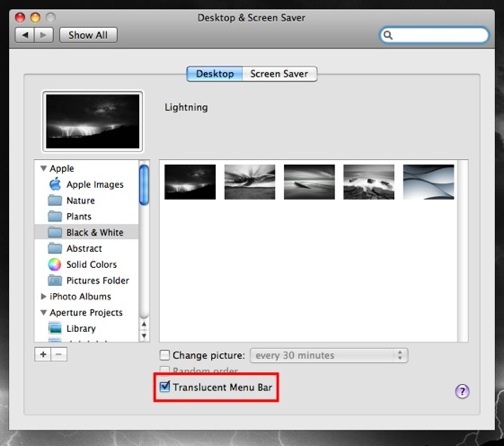 To disable the translucent menu bar uncheck Translucent Menu Bar. To enable it, just make sure this is checked. If you do not see this option, it is likely that you have installed a hack to do this prior to this release. Uninstalling or reversing this hack will often allow this option to appear. The safest option is to uninstall (or reverse) the hack prior to installing the update.